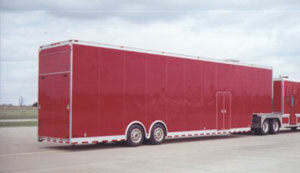 The GMR Mid-Liner is an excellent example of a Composite Construction Trailer. What this means to you as a customer is complete peace of mind. Although aluminum is light and durable, it is not the correct material to use throughout the construction of a Mid-Liner that is built to withstand the grueling demands of top race teams. Our engineering staff has designed what we at GMR believe to the best of both worlds. Aluminum is used where possible, steel is used where necessary. By combining the aluminum for light weight, with the steel sub-assemblies for structural integrity, we have a product that has built-in longevity. A true high quality trailer that lasts a lifetime. With your busy racing schedule, isn't complete dependability what you're really looking for? GMR TRAILERS is here for you after the purchase of your new GMR Mid-Liner, also. With a professionally staffed service and parts department, we are able to take care of any maintenance or appearance items, additional cabinets or other modifications, generator service work, etc. GMR Enterprises, Inc., 1250 Airport Road, Sullivan, MO 63080. Tel: 573-860-2838; Fax: 573-860-3708.